CERRITOS, CA/LA HABRA, CA (smt)- There was no repeat of the 2006 Bruin upset of the Zags as #2S-Gonzaga kept #11S-UCLA at bay, winning 74-62. In the other three games, there were some challenges but legendary coaches coach well, as Rick Pitino’s #4E-Louiville stopped #8E-NC State, 75-65, Coach K’s #1S-Duke outlasted #5S-Utah, 63-57, and Tom Izzo’s #7E-Michigan St made key plays to knock off #3E-Oklahoma, 62-58. Southern California will have 3 teams in the tourney, though none will be the University of Southern California, who despite the hot coach with the hot wife, finished last in the Pac 12. But their rival, UCLA, will be in the tourney after beating #4 Arizona for the conference championship. The Pac 12 won’t get any respect though, so don’t expect UCLA to be ranked too high. And in the biggest surprise of the conference championships, Cal Poly San Luis Obsipo (SLO) began the tourney 10-19 and proceeded to rout #2 Santa Barbara, upset #1 UC Irvine (my wife’s alma mater who was also trying to make the NCAA tourney for the 1st time ever), and outlast Cal State Northridge in the Big West final. Their first-ever appearance in the NCAA tourney, they are a shoo in for the First Four, so they probably won’t make the proper 64. Finally, despite losing in the Mountain West final, San Diego St. will be in the tourney. So three local teams aren’t bad. But I am not picking Cal Poly SLO if they somehow did make it the proper 64! Well, UC-Irvine had a chance to make the tourney for the first time but came out short (literally on their late 3-pt attempts). And the big UC, UCLA lost in the Pac 12 Championship. San Diego St. may be the only other SoCal team with a chance to make the tourney. Brackets start to come out at 3 pm PDT (you can add this to your calendar). We hope to get the online entry done by Monday morning, though in the past we’ve snuck it in before midnight Sunday. Check often. Please follow us (@HWCI_Pools) and use #hwcincaa for any tweets and for the latest quick (intra-day) updates. The initial email has been sent out so if you didn’t get one, please let us know. Everything is the same as before – $10/entry (up to 3 entries) with a Thursday 9 a.m. PDT deadline. UCLA is holding tough, tied with Florida at 39. Florida bounced UCLA out of the final and semifinal in back-to-back years so will this third matchup go UCLA’s way? 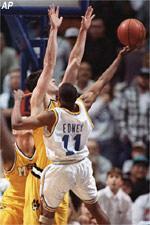 15 years ago today (March 19th), Tyus Edney went coast-to-coast in 4.8 seconds to help UCLA beat Mizzou and possibly saved the HWCI NCAA Pool. This pool was created because UCLA was the favorite to win it all by our UCLA alumni in a Westwood apartment. Of course, UCLA went on to win it all and the pool has continued ever since. But had UCLA lost, who knows, we may have deleted all files and closed down shop. Here is the recap, then done by Andy way back in 1995, the first year of our pool. As of 2 am this morning, we unofficially have 96 entries, just 5 short of our record! We are trying to match to the person RUBBER BISCUT, PRIDE OF TROY!, and BABY OIUJA (though we have a pretty good idea who these are, just need to confirm). Gareth M even funded putting President Obama’s picks into this pool (PRESIDENTIAL PICKS). Hopefully that bracket will bring him more money than the stimulus plan that was passed. And still no love for UCLA (just one has them in the Elite 8). How bad was UCLA’s pod in Philly? They’ll travel around 2,720 miles while their opponent VCU will travel around 245 miles. If UCLA wins, their two possible opponents will travel either 19 miles (Villanova) or 141 miles (American U. ).